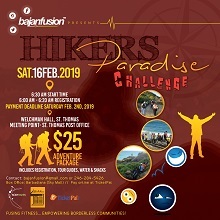 For the adventure seeking, gully-hiking, belly-crawling, rope-climbing, sometimes bugging (there WILL be bugs) fitness enthusiasts or those who just relish a challenging full body workout…let’s get pushing! Water and snacks (fruit & granola) will be provided. Register online via TicketPal Caribbean OR in store at Barbadiana (Sky Mall).